As we’re gearing up to bid 2012 goodbye and usher in a new year that will hopefully bring with it a better economic outlook, we also take a look back to see how the Discover network fared. To be sure, Discover’s many credit card offers are designed with specific consumers in mind. The network’s forward thinking and proactive approach to credit ensures its offers small businesses, students, travelers or those looking to rebuild their credit the right options for their unique needs. Here are the best Discover credit card offers, based on customer reviews and rewards programs. Is yours included? This is really one of the most versatile credit cards found anywhere. Currently, this gem offers a promotional 18 month balance transfer feature that can mean huge savings when you transfer your balances from other credit cards. While the 18 month 0% promotional APR is good only for transfer balances, you still are offered a six month 0% promo for your purchases. You’ll be charged a 5% transaction fee for cash advances; on the other hand, the rewards are quite impressive. Earn 1% cash back on purchases after meeting a $3,000 threshold. Plus, the rotating categories are part of Discover More Card, too and allows you to earn 5% cash back when making qualifying purchases. Your rewards never expire and you can use them in a number of ways, including gift cards. Even better is the absence of an annual fee. If there’s any caveat to this offer, it’s that excellent credit is required for approval. This is another fine option and one that’s quickly become the first choice for many consumers. You’ll earn one mile for every dollar you spent, along with redemption options for travel, merchandise or even cash. There’s a six month 0% APR for both purchases and balance transfers and then enjoy a low APR rate after that expires. Your rate, of course, is determined on your credit history. There are no restrictions on which hotels, airlines or rental cars you choose either, nor are there blackout dates. There’s no annual fee and you can also request a second card at no additional cost. Miles by Discover credit card is one reason why Discover holds on to its number one ranking in customer satisfaction. This is a relatively new product in the Discover family and offers those with new or poor credit the opportunity to make changes to their credit scores and history. Approval is based on a number of financial considerations, making it easier to qualify. There’s no security deposit required, though there is a $75 annual fee. You can apply online for an instant decision. Most often, the card has a low line of available credit though it reports to all three credit bureaus and the limit will be increased as your patterns and repayment behaviors emerge. The Continental Finance Matrix Discover Card holders will have access to online account management and around the clock customer service. Be sure to carefully review the terms and conditions with this offer so that you understand the fee structures. We like this card because of its simplicity, which is what young adults and college students need as they begin building a credit history. It works great with the traditional lifestyle of the college consumer. It should be noted, though, that as a part of the new financial laws, a college student can’t get approved unless he can provided definitive documentation that proves his ability to repay the debt or a co-signer. This is a classic rewards card where card members earn at least 1% on virtually every purchase. Plus, new Discover Student Open Road card holders will earn double cash back on things like groceries and auto maintenance. Card holders will also have access to ShopDiscover, an exclusive online group of brands and products. There are no annual fees, $0 fraud liability and even a nine month 0% intro APR. No Discover “best of” list is complete without the Escape. We like this offer because of the double miles earned on every dollar spent, the 0% intro APR on both purchases and balance transfers for six months and no restrictions at all on your travel options. There’s one more bonus that can sometimes be overlooked and that’s the the bonus 1,000 rewards miles each month for the first 25 months if you use your Escape by Discover card for at least one transaction a month. Remember, this is just a few of the amazing financial products Discover offers consumers. Its emphasis is and always will be on customer service, but the great rewards, product versatility and low fee structures are icing on the proverbial cake. 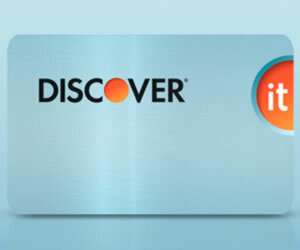 The ShopDiscover, as mentioned above, is exclusive to Discover card holders. With hundreds of retailers and varying cash back percentages, it’s truly the way to go and odds are, you already shop these merchants. Kohl’s has a 10% cash back opportunity, Ace Hardware, Atlantis and More Bahamas Resorts and Bath & Body Works all have 5% cash back while Fossil, Groupon and Fannie May all have at least 15% cash back. Be sure to spend some time on the Discover site too and learn more about not only its credit cards, but other goings-on, including Discover Giving. This partnership with JustGive, allows Discover customers to choose from a database of more than one million charities they can donate to via their Discover cards. We especially like the feature that allows you to donate in your name, in honor of a loved one or anonymously. You can set it up as a one time donation or recurring gifts. These donations also earn rewards points and you may also donate your cash back bonuses, as well. The donations are forwarded to the charities every month, so your contributions are felt quickly to those organizations in need. Donate safely right from the Discover website. This is a great opportunity to do good and while we’re embarking on the holiday season, it’s the ideal time to create new holiday traditions. So which Discover credit card do you carry? Let us know your experience with this credit card giant.